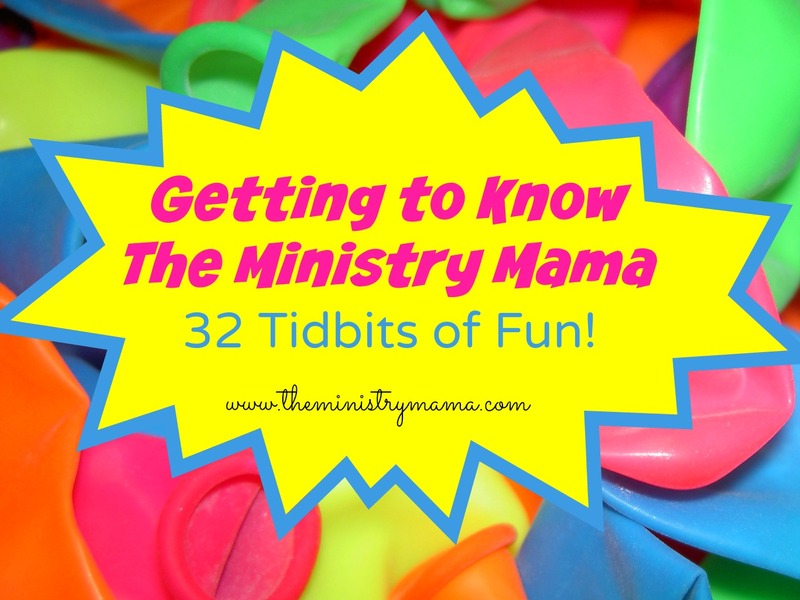 In celebration of my 32nd birthday this week, I thought I would write out some things about myself to help you get to know me, The Ministry Mama, a little better. They’re just tidbits of little quirky information things about myself or things I think about. As much as I love blowing out candles, I hope you enjoy! 1. If I could go anywhere in the world I would visit Uruguay, a country I fell in love with while watching a missionary’s presentation on a living room wall. 2. My greatest writing inspirations come from conversations I have with other ladies about their ministries, questions, and heartaches. 3. Our family loves to visit aquariums. 4. Pinterest is one of my frequent time-wasters. 5. One of the most exciting projects I was a part of was writing a fictional Christian story a few years ago in a summer writing club. The work was never finished but Lord willing, someday it can be picked up again. 6. I am notorious for starting books and never finishing them. Very similar to blog posts, I have 36 unfinished drafts and many more ideas in my head! 7. One of my favorite things about parenthood is reading children’s books I’ve never read before or listening to them on audiobook. 8. My ideal writing space is any quiet place. 9. The one and only pet we have ever had since we have been married is a hedgehog named Herman, that turned out to be a girl! We never could get out of the habit of calling her Herman. 10. My favorite colors are sapphire, lime green, and silver. 11. Turquoise is my favorite color to wear. 12. Summer is my favorite season! 13. I graduated high school with 100 people from a small country school in Texas. 14. My favorite home decoration is my real longhorn skull that hangs on our wall, we call it Bullet because it has a huge bullet hole in the forehead, which is now covered with a medallion. My mother’s friend gave it to her before she gave it to me. 15. Hydrangeas and yellow roses are my favorite flowers. 16. I am a sucker for Masterpiece Classics on PBS. 17. Pumpkin chocolate chip cookies are one of my weaknesses. 18. Chicken fried steak is another, which is a fancy my mother and I share. 19. I am most self-conscious about my teeth. 20. I prefer hoodies as my most comfortable winter lounge wear. 21. One of my dreams is to have a flower and vegetable garden. 22. Staring out a window helps me think and clear my mind. 23. One of my most embarrassing moments was when my son threw himself down on the floor in a fit in the middle of a large airport when I was 7 months pregnant and trying to pull our luggage. 24. The worst meal I ever made was scrambled eggs in a cast iron skillet in the first few weeks after we were married. Black chunks should not be in your eggs! 25. My way of wearing shoes is finding a pair that I like and wearing them until they are worn out and ready to fall apart, and then going to find another new pair and starting the cycle again. 26. I wish ladies wore stylish hats like they did in the ’20’s. 27. Chips and guacamole are my favorite late night snacks. 28. My hope is to one day record an album either a solo album or with my family. 29. I have a soft spot in my heart for little old people, they make me feel a connection to my grandparents and great-grandparents whom I spent regular time with as a child. 30. Being a bold witness is one of my greatest struggles. 31. Sentimentality and I stick together like glue. 32. God’s love never ceases to amaze me. He always comforts and loves me, showing me in the most special ways. He also always like to challenge me to increase my faith, to which I am very thankful once I am through the circumstances that cause me to live by faith. 33. (One to grow on) I love to create surprises for other people but do not like them for myself. Except for a baby shower my friends gave me for our first son, that was a fun surprise! So, there you go! Maybe we share some things in common now that you never knew before which makes life exciting. Happy, happy birthday!! Loved reading your list! 🙂 When you’re ready to make #21 a reality be sure to pick up the book Square Foot Gardening. The mix for the soil is unbelievable! You’ll be amazed at how much you can grow in a small space. That sounds like a great help! I tried container gardening and between my kids sitting on my plants and bugs it was a disaster. Thanks so much Cyndi!